Modify live shipping rates: surcharge, deduct or override rates, provided by carriers. E.g. surcharge rates for delivery to Hawaii and Alaska, correct rates for LTL freights. As soon as default Magento delivery options provide shipping rates transmitted via carrier APIs, store owners have no opportunity to modify them, thus losing potential customers and money. Why not exploit shipping functionality to the full and get more sales by tweaking live shipping rates? Due to a feature-rich Magento 1 Shipping Rules extension one can generate a great variety of flexible rules to recalculate and overwrite rates by popular shipping carriers like UPS, DHL, FedEx and many others. The module offers a wide range of parameters for rules creation which can be used both individually and in combinations. Besides, the extension provides a number of algorithms to calculate shipping rate surcharges, discounts and overriding. 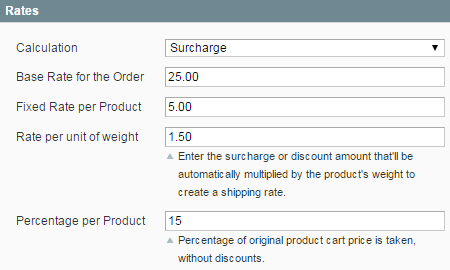 IMPORTANT: The module lets admin users easily modify shipping rates by recalculating them according to rule conditions (surcharge, discount, replace). In case you need to restrict shipping for particular locations or disable specific shipping methods please take a look at the Shipping Restrictions extension . You can change delivery prices both by flat amount and by percent at the same time. It's also possible to add a base amount for the whole order. E.g., Add $25 surcharge for the whole order and $5 + 10% of the product price for each individual product. Or apply a zero discount for the whole order, but 5% of product price for each individual item. Use this option to increase or decrease shipping prices based on the product weight. For instance, if the product's weight equals to 10 kg and the surcharge rate per unit of weight is 2 USD, the final shipping price will increase on 20 USD. Order attributes, such as subtotal, weight, items quantity are available for rule conditions. Also you can set conditions based on address line, zip code, state or province, country. E.g. Surcharge orders with subtotal less than $200 and weight more than 30 kilograms, which need to be delivered to California. You can employ all product attributes such as category, brand, SKU and so on. For example, you can set a rule to apply to products from category 'Shoes', of brand 'Gucci', from 'leather' material. Create shipping rules based on average order value. It's also possible to modify rates depending on the order status and the number of days afer last order placement. 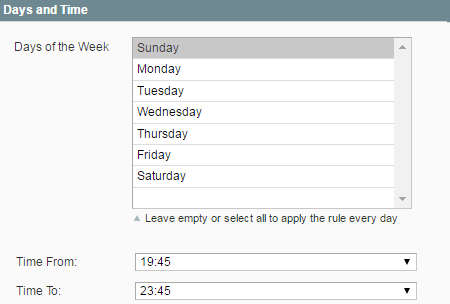 Specify particular days of the week and time intervals for rule application. For instance, you can establish extra charges for evening delivery. Create flexible shipping rules based on any customer attribute you need. For example, you can offer lower shipping rates to loyal customers who have registered at your store more than a year ago. This option is extremely useful when it comes to creation zip code based rules. It enables you to prevent rule application for all zip codes starting from '123' or ending with 'XYZ' or vice versa - apply the rule only for codes that meet specified conditions. Use coupons to apply or cancel shipping rules. Include tax in product conditions. Arrange countries in groups to apply rules for the whole area. Apply or skip rules for admin orders. Specify priority for rules application. Set up rules by store view and customer groups. Shipping table rates extension gives you full control over shipping. Create any number of shipping methods: flat rates, weight-based rates, etc. Use flat and percent rates, combinations of address, weight, price and quantity to calculate shipping. Import rates and edit them manually. Use rates based on product type, e.g. for extra large, toxic items. With Shipping Restrictions extension you can adjust shipping process to your legal and business needs. Block shipping carriers or some methods of shipping carriers and put shipping restrictions based on customer group, order total, weight and other shipping parameters. Payment is an essential part of a structured shipping process. Take this aspect under control with the Amasty Payment Restrictions extension. Restrict payment methods by by country, state, customer groups and store views, order info, customer and product attributes. Will the extension allow adding a surcharge for certain shipping methods for particular products? Yes, sure. The module allows you to add shipping surcharge for live rates of particular groups of products. Can I set different flat fees for different product types? Yes, you can do this with our Shipping Rules extension. You can set a Magento shopping cart rule depending on a product type. Yes, the Shipping Rules extension allows for using a wide range of showings for rules creation, as well as different algorithms for discounts. By making changes in the address conditions of the rules configuration you can set the desired shipping postcodes. Read on to see the screenshot. Yes, sure. A Magento free shipping rule can be set by making changes in the address conditions of the rule configuration. Go on reading to see the example. I want to use this extension in combination with other shipping modules. Will it work? The module is compatible with most of the shipping extensions that implement Magento shipping interface. If there are any conflicts, we will fix them for you. Shipping Rules extension is 100% compatible with our Shipping Table Rates and Shipping Restrictions. Will this extension allow handling shipping price by custom options of products? No, Magento shopping cart price rules don't work with custom options, but work with attributes only. Yes, sure. You can set shopping cart price rules based on a customer group. To apply a rule for a particular customer group you should make changes in the rule configuration. Read on to see the screenshot. Yes, shipping rules can be set based on different customer groups as well as store views. To apply the rules for particular stores you need to make changes in the rule configuration section. To see the screenshot follow the link. Can I change the name of a shipping method with Shipping Rules? No, there is no such an option. No, the extension works only with existing shipping methods, therefore, you won't be able to create shipping methods. Yes, with the Shipping Rules extension you can choose for what products to modify the shipping rates. You can make it through creating appropriate conditions in the rule configuration section. Follow the link to see a screenshot. Can multiple shipping rules be applied to the shopping cart simultaneously? No, a product can have only one active shipping rule at a time. If no conditions are specified on the Product tab, only one shipping rule will be applied to the whole shopping cart. Is it possible to charge the actual cost of shipping after the order is placed? No, shipping cost can be charged only during the checkout. Can I prevent shipping to PO Box addresses? If you need such a feature, you should use our Shipping Restrictions instead of Shipping Rules. Can I restrict a shipping method per item with Shipping Rules? No, you would better consider our Shipping Restrictions module to achieve this. Can this module calculate the price of shipping based on weight? If you need to calculate shipping cost based on product attributes, including weight, you should use our Shipping Table Rates extension. Can I create shipping rules to restrict shipping? Shipping Rules extension only replaces, gives discounts or surcharges standard rates according to the rules you set. If you need to restrict a particular shipping methods please use the Shipping Restrictions module by Amasty. A great way to implement complicated rules. I had an issue with the way one of my rules was configured, the developers sorted it for me within 24 hours. I have purchased 4 of the Amasty plugins and I am very impressed. All the products function perfectly and if there is an issue the support team is amazing. When the last major SUPPEE update came out the plunging were updated the same day. Big thanks to the team. I have some specific shipping rules that this extension managed to cope with. The thing I like most is the ability to set up different shipping rules for different customer groups. The extension and support were superb. Helped us resolve a conflict with webshopapps. Awesome! This extension is good at widening native Magento shipping functionality. We have set up about 200 rules already. It's complex but manageable. I would be happy to see an ability to export these rules as when I use this extension on another store, I will have to re-create a rule by rule which is quite difficult and time consuming. I’m using FedEx shipping but I have some custom shipping options . On the one hand I need different shipping costs for each customer group (I have 3 ones), on the other hand, I have some fragile items, and their shipping cost is higher than ordinary. The extension helped me to create special shipping rules to handle all the options I have. I can’t say that creating rules is simple, I had to turn to the support a few times, but at the end everything works fine. I got the help I needed and very fast at that. Highly recommend the extension and the company (I have a couple of other extensions of theirs too and they're all great). .When purchasing ANY third party software that will be integrated into an existing project the two main concerns for us are 1. will it solve / improve the situation 2. will the CUSTOMER SUPPORT be helpful. This app is a must have if you intend to improve the shipping rates. It makes life with Magento much easier. I get exactly what I need, helpful and nice module. The plugin does exactly what it tells and its pretty easy to use as well. The customer support is just fantastic and very fast too. Overall very professional and impressive. Good extension for a very reasonable price. Extremely satisfied with support service which solve my issues straight away, never ignore my emails and give helpful tips. We used this in one of our projects and result we got out of it excellent. It was bit difficult to figure out how to setup etc. but at the end it was great. And our client is very happy. To different regions for fresh flowers. I have a flower shop and I need to have different rates depending on the weight of flowers, on the time they are fresh, the region delivery will be to, etc. For example, if people order roses to be shipped to another town, we need a special price for the container to deliver them fresh. With the extension it's easy and quick. Like. the extension is efficient, no words, but the support is even better! Ruslan helped me to adjust a very sophisticated rule, which was absolutely necessary for our new promotional compaign. We have an international store, and it's quite tricky to adjust all shipping rules cause we have a lot countries for delivery and many regions with different taxes, rules, etc. Amasty Shipping rules module became a breath of fresh air for us! When purchasing ANY third party software that will be integrated into an existing project the two main concerns for us are 1. will it solve / improve the situation 2. will the CUSTOMER SUPPORT be helpful. We purchased Amasty's Shipping Rules Extension and it totally rocked the house! PLUS the CUSTOMER SUPPORT was off the hook! We had an issue (and receiving major heat from our client) that developed from our lack of expertise in using Magento and Alex from Amasty got back to us ASAP and solved it immediately! These guys are the absolute best! If they're reading this...thank you for hitting the mark on all levels! We absolutely recommend this company! Another great product from Amasty - we always check their site first for extensions when we need them. Well coded, well documented, well supported! We had very complex shipping rules we needed to set up (per product, per category, and per combination of categories) and this extension did the trick! I needed a little help getting the rules right and Amasty replied within a few hours of my support ticket - awesome! Great variety of shipping rules! Great extension. Worked on Magento 1.7.0.2 like a charm. I have contacted a company for a support and they respond at the same day. I was looking to create a shipping rules so the system will charge a certain percentage from the total amount, this extension was perfect for it. Thanks. So we hope to use your module to offer separate shipping tables to each customer group on each website. Another problem we hope to solve is to distinguish between packages and letterbox size shipments by separating items using a custom attribute. This is the second Amasty extension we bought, and again it was a pleasant experience. Support is responsive and kept helping until the extension worked fine; even though it turned out the problem was a Magento locale-translation error, and not the Amasty's fault. Fantastic extension and spectacular support! I had some issues setting up the rules the way I wanted them (my fault for not being able to figure out how to) and I got the help I needed and very fast at that. Highly recommend the extension and the company (I have a couple of other extensions of theirs too and they're all great). – Inner optimization. New algorithm for configurable product validation. 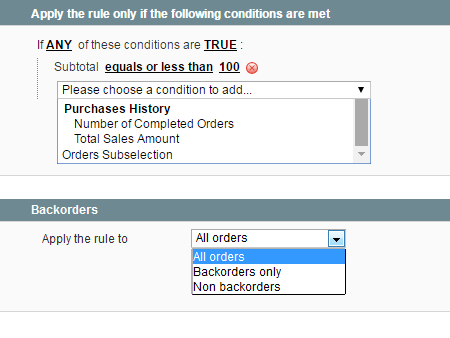 – Option to show shipping discount provided by rules right in the shipping calculation block and at the checkout. – New condition types - by city, by subtotal after discount. – Ability to set maximal / minimal final rate after a rule gets applied (not only max modification amount). – Ability to use customer attributes for rule conditions when Special Promotions Pro is installed. – Fix for 1.5.x versions of Magento CE. – Product attribute conditions for the whole order. E.g. it is possible to apply surcharge or discount for the whole order, if there's a specific product in it. – Handling percentage - ability to surcharge or discount total shipping cost by percent. – Amazing new feature. Now you can specify a coupon created in 'Shopping Cart Price Rules' section and the shipping rule will apply only when the coupon is used. – New conditions "starts from" and "ends with". Especially useful for zip codes - you can specify, that a restriction should apply to all zip codes starting from '123' or ending with 'XYZ'. – Condition option for address line, e.g. you can create rules for addresses with PO Boxes. – Fix of cache issue for product attributes in the conditions.